John Prescott has said he will stand down as an MP at the next election. The former deputy prime minister made the announcement at a weekend garden party, the chairman of the Hull East Labour Party, Steve Brady, said. Mr Prescott, 69, who has been an MP for 37 years, said it had been a "huge privilege" to serve his constituency in the House of Commons. The Hull East MP, seen as a mediator between Tony Blair and Gordon Brown, quit his government post in June. He will officially notify local party members on 16 September. Mr Prescott said: "It has been a huge privilege to represent the people of Hull East over the last 37 years. "I will continue to do that until the next General Election, whenever that might be." Councillor Brady said Mr Prescott was a popular MP because of his "common touch" and spent his time solving difficult problems for his constituents. This had been something the national media had not often reported, he said. "He is a good MP and has served his constituency excellently." When Mr Prescott announced he was to step down, "there was loud applause" for the work he had done, as well as tributes paid, Mr Brady said. "There were many people who were there at his original selection who were there also to pay tribute." Mr Brady said Mr Prescott's decision to stand down had been expected and that he had made the announcement ahead of official confirmation in September so that his constituency could "get on with selecting a new MP". Mr Prescott's son David and former Shipley MP and Gordon Brown aide Chris Leslie are among the contenders. "It's no secret that a number of people are in the frame for selection already," Mr Brady said. BBC correspondent Norman Smith said Mr Prescott would certainly be missed, adding that he could be the last old-style Labour politician the country will see. 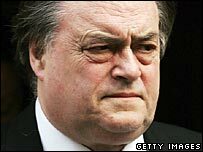 Mr Prescott's working life took him from a job as a steward on cruise ships to the top table of government - serving as deputy prime minister throughout the Blair administration. Along with his political achievements, such as working towards the Kyoto protocol on climate change, other events catapulted him into the headlines. In the 2001 general election campaign he scuffled with a man who threw an egg at him. And in 2006, he admitted to an affair with secretary Tracey Temple. His image problems were later compounded when a newspaper published pictures of him playing croquet with staff at his grace-and-favour country residence, Dorneywood. But as an Old Labour stalwart, Mr Prescott helped to maintain links between the party leadership and membership. He remained an MP after quitting the government when Mr Blair left office and will replace Manchester Central MP Tony Lloyd as the British representative on the Parliamentary Assembly of the Council of Europe. Earlier this month it was confirmed that he was in talks with publishers over his memoirs. Many political commentators believe he will enter the House of Lords soon after leaving the House of Commons.